From left: Issa Trust Foundation’s medical director, Pat Brophy, with dental hygienists Silvia Flores and Mary Sullivan. A MEDICAL team comprising more than 40 volunteers from the United States of America joined forces with the Issa Trust Foundation (ITF) to deliver a four-day mission across three districts in St Mary last month. The delegation, led by the ITF’s medical director, Dr Pat Brophy, comprised pharmacists, physicians and therapists from hospitals in New York, Florida and Indiana, and targeted children in Oracabessa, Islington and Mason Hall with a series of mobile health clinics. According to Brophy, the foundation, which celebrates its 10th anniversary this year, has developed a highly efficient process for providing quality, paediatric medical care as part of its long-term strategy to support and partner with local medical and other organisations. He told Rural Xpress: “Four years ago, we introduced an electronic medical records system and now we’ve restructured into something like a clinical microsystem, so we’re able to run through over 200 patients a day, and give the kids great care. “The system is a very lean process. The kids come in and register on our computer database, so we know if they are repeat visitors. From there, they have their vital signs checked and we monitor weight, growth, blood pressure and pulse and respiratory rates. While the children receive full body, dental and eye examinations, and medication and eyeglasses if necessary, completely free of charge, the foundation collects detailed information about each patient, which it shares with the Ministry of Health (MOH). Brophy claims that between the annual missions and the ITF’s paediatric residency programme at Couples Hotel in Tower Isle, the charity has delivered health-care services to more than 60,000 children since 2010. 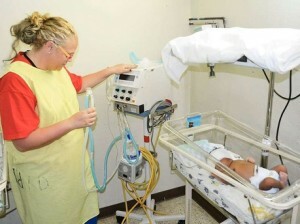 Nurse Jerre Grefe has travelled on four missions to Jamaica and watched the project flourish in recent years. She said: “I keep coming back to Jamaica because it’s a wonderful country with wonderful children. The ITF’s primary objective is to support local communities and help the Government develop a “… sustainable and integrated health-care system,” said Brophy. “We’ve been working towards developing an educational programme that is in alignment with the MOH’s plans, particularly for neonatology. 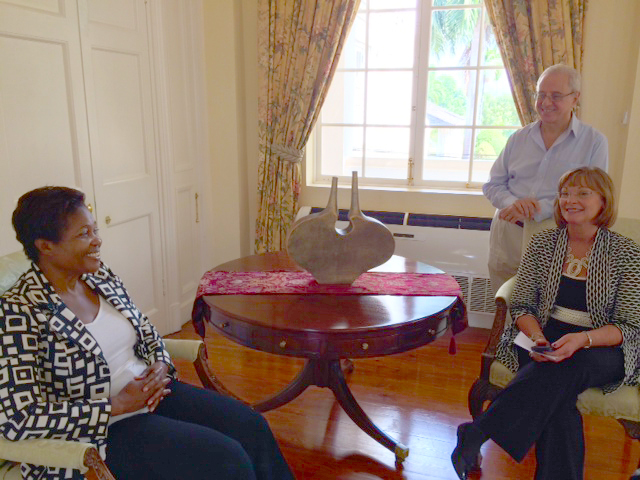 Picture: Her Excellency, Lady Allen (far left) in discussion with Diane Pollard, President & CEO of the Issa Trust Foundation and Paul Issa (standing), Chairman of the Foundation. His Excellency, Sir Patrick Allen – Governor General of Jamaica and his wife, Her Excellency, Lady Allen, are patrons of the Issa Trust Foundation. 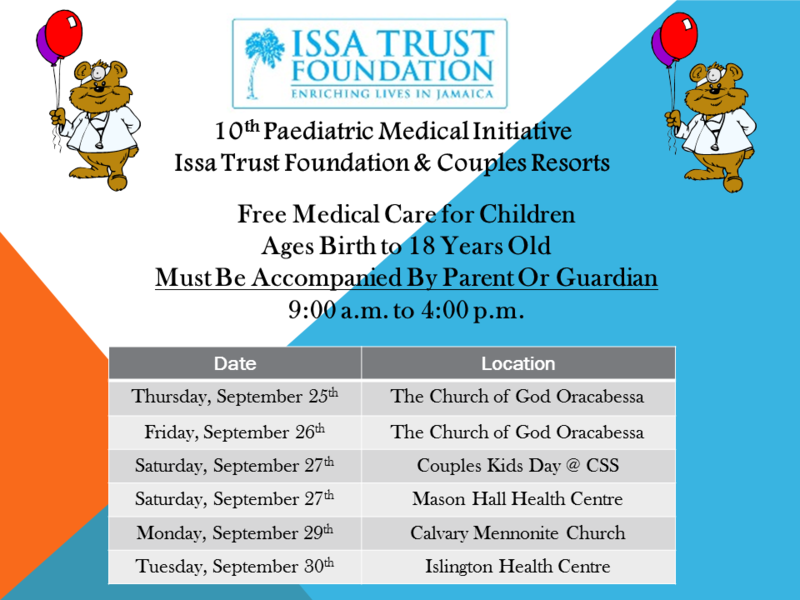 More than a thousand children will treated during the Issa Trust Foundation’s 10th paediatric medical initiative scheduled for September 25th September 30th. Dr. Pat Brophy, Medical Director, “The Issa Trust Medical Initiatives provide Paediatric focused general care for Children in Jamaica. While this has been the most notable component of our care program it has been largely enhanced by our year round ongoing efforts. We have dedicated ourselves to providing health based education, training and resource development support for the healthcare providers tasked with looking after Jamaica’s Children. In conjunction with other non-profit health based organizations and an active partnership with the Jamaican ministry of health we have provided real tangible improvements in child health. Importantly this has been done in a very cost effective and inclusive manner. We believe that working with the Jamaican government and local providers we can work at building a sustainable healthcare program for babies and children.” Kerri Cook, Lead RN, “nothing can make you feel better than helping a child get healthy! Thank you Jamaica for allowing us to come into your country and provide healthcare to your children. We will treat them like our own! And thank you for treating us like family! ” This year we have medical providers from many hospitals such as The University of Iowa Children’s Hospital, Iowa City, Iowa, Mercy Hospital, Des Moines, Iowa, and Rainbow Babies & Children’s Hospital, Cleveland, Ohio. The team of 41 volunteers includes paediatric pharmacists, intensive care physicians, and hematology oncology physicians, general paediatricians, nephrologists, nurse midwife, pulmonologists, neonatologist, paediatric nurse practitioners as well as a paediatric nurse and respirator therapists. The team will also be providing health and education lectures at St. Ann’s Bay Hospital. In addition, this year all children will receive free eye exams and receive their glasses, if needed, at no cost, immediately after their exam, provided by the Michigan Lions. 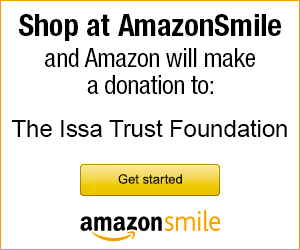 The Issa Trust Foundation was established in 2005 by Couples Resorts as a nonprofit organization. The mission of the Foundation is to provide a system of prevention, health promotion and education, community health improvement and other services to promote well-being and development for the people of Jamaica. We were recently honored to be featured in a six-page story in Live Happy! magazine. We deeply appreciate the recognition. Click here to read our feature in Live Happy Magazine! Amazing to read about our volunteers and how “volunteering” changed their life! There were character-building lessons, too, such as learning to be more grateful and to rethink things that were previously deemed important. We have seen time and time again how one person can make a difference in the lives of those in need. After reading Live Happy article, you too may be inspired! Contact Diane at issatrustfoundation@yahoo.com and live your dream! Minister of Health, Hon. Dr. Fenton Ferguson, has expressed appreciation for Issa Trust Foundation’s partnership with the Ministry of Health, local professionals and administrators, and for providing medical care for thousands of children over the last nine years. In addition, the foundation continues to provide training for medical providers and donations of equipment. The Minister expressed support for the island wide pediatric nephrology workshop and outreach to educate rural pediatricians in the recognition and management of children with chronic kidney disease.